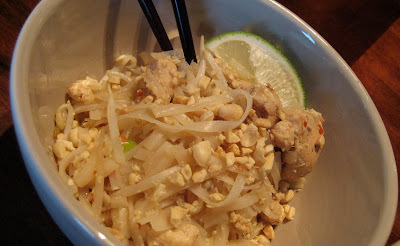 Up Mommy Creek: Authentic Pad Thai...Yummy! So, last night I had a craving for Thai food. Since my maternity leave doesn't really allow for too much room in the budget for frivolities like eating out, I decided to make Pad Thai. This recipe is the real deal, so to speak. It's from a cooking school (basically, 2 ladies, 6 hotplates and a whole bunch of delicious!) 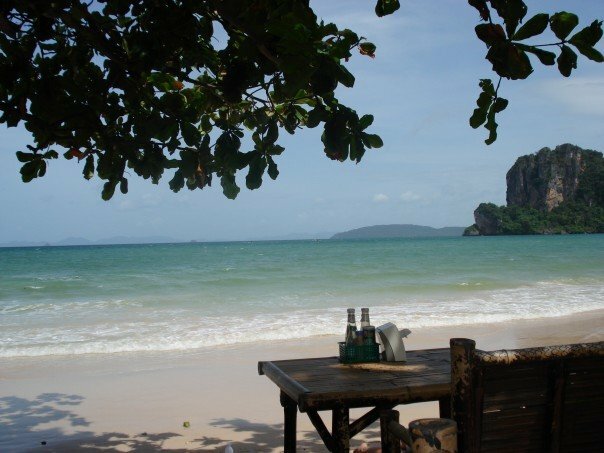 in my favourite place in Thailand: Railay. It actually might be my favourite place of all the places I've ever been. It's definitely in the top 3. Railay is this awesome little island-like paradise. 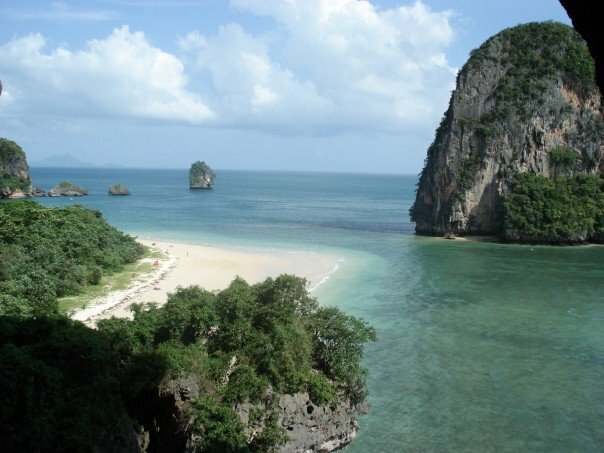 It's on the mainland in Krabi province, but only accessible by boat due to the crazy cliffs, which makes it a rock-climbing paradise. It's also probably one of the most beautiful places in the world, and is filled with some of the best people on the planet. I lived just a short longtail ride away for almost 9 months, and I think about it almost every day... Hubby and I can't wait to go back someday. Yup. I used to live right around that big rock on the right...sigh. Anyway, this is the recipe for Pad Thai, from The Rock in Railay Highlands. Enjoy! Heat the oil in a wok on med-low heat. Add tofu (if using) and then garlic. Add prawns or chicken. When cooked through, add eggs and stir. When egg is dry, add prepared noodles. Then add all the rest of the ingredients and stir. Add the seasonings and stir until everything is heated through. Garnish with peanuts, lime and cucumber. We also sprinkle dried chili flakes on our servings to taste. As with most Thai cooking I have been taught, measurements are approximate, and the recipe works best if you adapt it to your own tastes. It's pretty much impossible to screw it up. Trust me. ;) Also, it is really fast to prepare, so it's best to do all your chopping and prep before so everything is ready to go when you start cooking. I usually mix the sauces and sugar together in a little bowl so I can just dump it in at the end. Clearly I need to read more thoroughly! ;) I see your little bundle of joy is already here! HI! I'm a new follower from Tag-Along Thursday Blog Hop!! I'm following you back! I love your blog name! So so cute! I can't wait to continue to get to know you! Stop by anytime! Hi! I am a new follower from Tag Along Thursday! I LOVE Pad Thai! I havent had it in forever! Well, Thank You! From follower #70! lol~ This recipe looks yum-o!